This is book 3 in the Michael Nicholas ( Book Series) the first 2 books in the series were amazing so I was opening this book with high expectations. 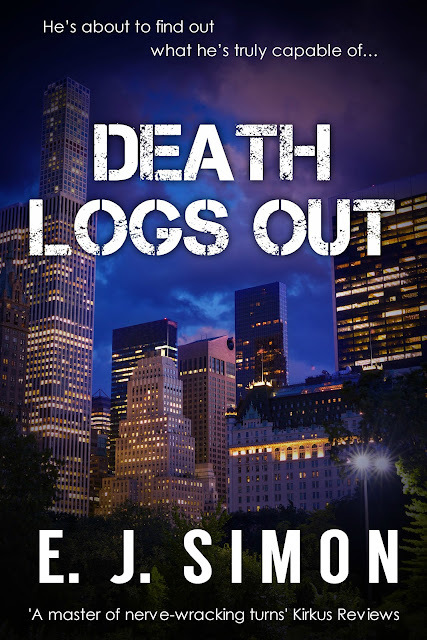 E. J. Simon’s third book Death Logs Out didn’t disappoint it was another page-turning Technothriller. Death Logs Out is a fast-paced book with well-written characters. The author’s writing style keeps readers keep you turning the pages the book grabs your attention as soon as you start reading, the storyline is excellent one that holds the reader’s interest. The Michael Nicholas series is uniquely written. Death Logs Out is a stand-alone however I highly recommend reading the other two books in the book series Death Never Sleeps and Death Logs. Is Alex Nicholas really dead? Two years since the brutal shooting of Alex Nicholas, a gambling underworld boss in Queens, NYC. But his brother, Michael, a respected CEO, struggles with a secret: his murdered brother has been communicating with him via his laptop using AI. This AI-Alex can foresee dangers in Michael’s path, and appears to be trying to help him – even controlling machinery and electronics via WiFi. Meanwhile, trouble is stirring in the historic capital cities of Rome, Berlin and Paris. Inside the Vatican, Monsignor Kurt Schlegelberger has designs to build his power and prepare for the sudden ascension of the Free Forces Party, a throw-back to the Nazis. This fast-paced third installment of E.J. Simon’s Death series will keep readers guessing to the very end.